(Nanowerk News) A new study clearly shows the importance of a lotus leaf’s nanoscale hair-like structure on its self-cleaning ability. Researchers at the General Motors Research and Development Center report the influence of micro- and nano-scale structures on the wetting behaviour of lotus leaves. 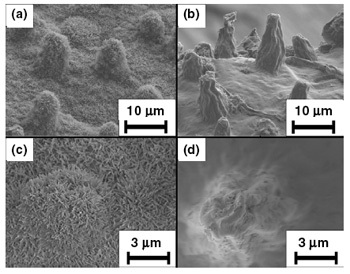 The findings were published in an article titled "Effects of micro- and nano-structures on the self-cleaning behaviour of lotus leaves" in the Feb. 10, 2006 issue of the journal Nanotechnology. 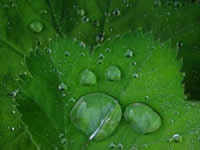 When rain falls on lotus leaves water beads up with a high contact angle. The water drops promptly roll off the leaves, collecting dirt along the way. This self-cleaning ability or lotus effect has, in recent years, stimulated much research effort worldwide for a variety of applications ranging from self-cleaning window glasses, paints, and fabrics to low friction surfaces. The lotus leaf's ability to shed water is due to its multi-levelled roughness. The combination of the microscale mounds and the nano-scale hair-like structures causes falling water to bead up and roll off the leaf. By altering the surface structure of the leaves while keeping their chemical composition approximately the same the researchers were able to confirm the importance of the lotus leaf’s nanoscale hair-like structure on its self-cleaning ability. They did this by heating the leaf until the nano-scale hair-like structures melted, at 150°C, coating the leaf surface. This heating process, while keeping the chemical composition of the surface approximately the same, alters the roughness such that the contact angle is decreased and water droplets no longer roll off the leaf. Besides helping design self-cleaning surfaces the findings of this work may also improve the understanding of wetting mechanisms.